In the first half of the 16th century, the Spanish fleet led by the Portuguese navigator Ferdinand Magellan, arrived in the Philippine shore. From the original five ships only three crossed the pacific and reached the Las Islas de Poniente. 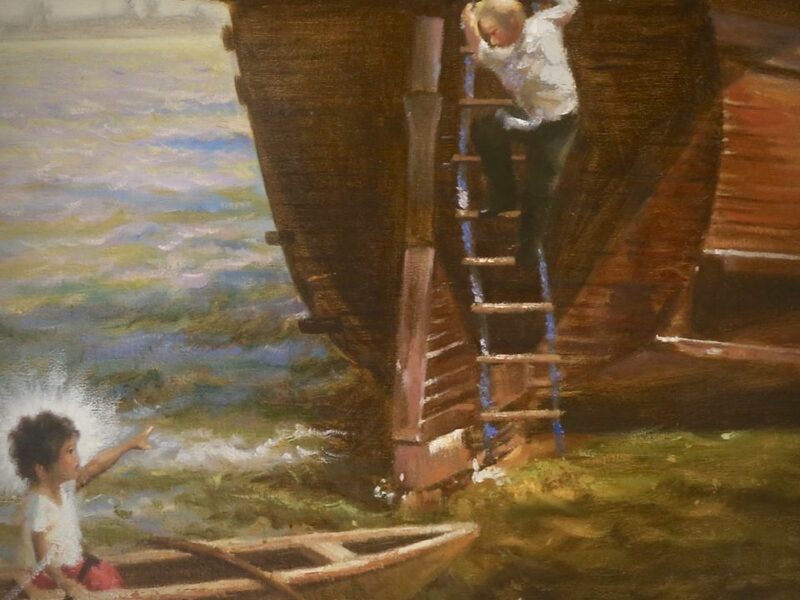 Just like any long journey, the ships were loaded with many supplies particularly alimentations and other important stuff that would last for several months. Noteworthy to mention that every single ship also was laden with cargo for merchandizing and gifts to those who they would offer friendship along the way – these varied from important metals, clothes, home and kitchen wares, arts and crafts, and religious icons. Though it was not the Philippines they intended to find, they established themselves and made friendship with the natives of several islands and the island of Zebú. They raised crosses in many places; donated gifts including the image of the Sto. Niño and the Virgin Mary; and forty-five years later, arelic of Ecce Homo was uncovered, also believed was brought by Magellan’s fleet. Pigaffeta did not mentioned explicitly about a cross being planted in Cebu by Magellan himself but rather telling them (Humabon and his subjects) to set up a cross themselves in place of their idols. Gaspar de San Agustin on the otherhand, narrated that on the fourth day of their arrival, a Mass was said before the cross which they had erected. 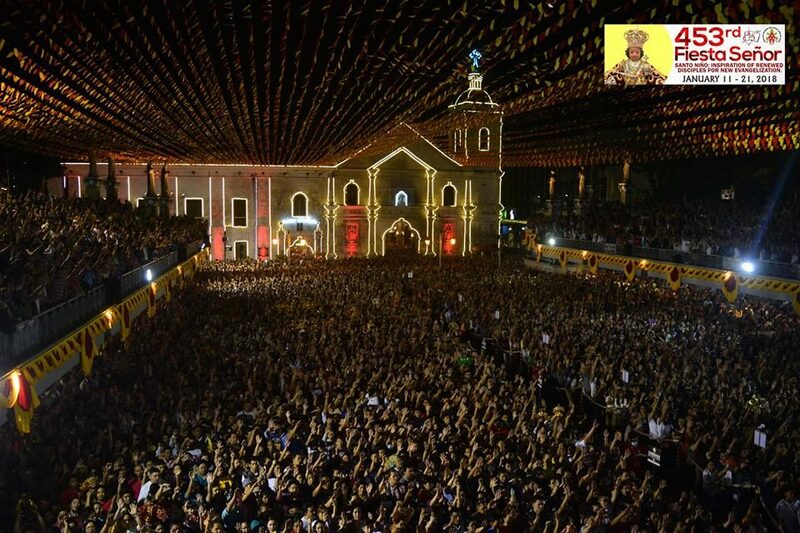 Given the presumption of the above statement, considering that Cebu was an important island and that they celebrated Mass and baptism, no doubt that a cross must have been put up certainly. To support the preponderance of our evidence, Antonio de Herrera mentioned that after the death of Magellan, a cross was being tried to be removed by the natives while the Spaniards could still see it from afar. Another Franciscan chronicler also mentioned that the cross was never removed and served as a trophy at Magellan’s grave. While it is difficult to reconcile among the early chroniclers of Philippine history including the Augustinians that Miguel Lopez de Legazpi and his troops found a cross when they landed in Cebu except for Fr. DíezAguado, OSA and Fr. Colin, SJ, who narrated that after the Sto. Niño was found, the Cross of Magellan was also located. However, the Conquistas of Gaspar de San Agustin and Crónica of Juan de Grijalva mentioned about another cross instead, that Fray Martin de Rada set up right after they landed. Accordingly, on November 2, 1565, there was a fire in Cebu and the same miraculous cross made of dry bamboo located in front of the convent, while it was engulfed by fire, the flames did not consume it, and it did not even suffer a slightest burn. Certainly, no one could testify the certainty of the Cross in Cebu, except its appeal to the idea that Spanish navigators put up a cross wherever they go. And this cross of Magellan is deemed that it was not destroyed by the natives and might have survived until the arrival of Legazpi, as to its location, no one exactly knows. Given the fact that what is encased inside in the present location is a kind ofwood but certainly not a bamboo, thus defying the notion that it’s Rada’s. 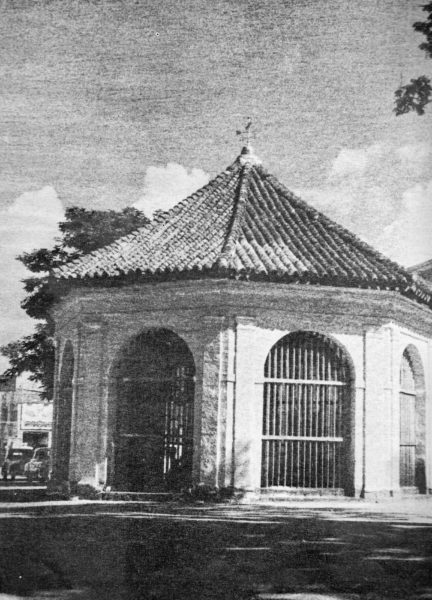 It was since only in the year 1735 that a small kiosk was erected and only in 1834 that the present gazebo was constructed, and the wood was encased to prevent people from chipping bits from it, believing it to be miraculous that this Magellan’s Cross became known. Still history is silent of the origin of the cross that Fr. Juan de Albarán tried to preserve which is the cross we have in the Plaza Sugbu until today. To envisage all possibilities of history we would have to go beyond what is written. However, we cannot simply conjure up certitude. The image of the Sto. Niño is well-documented when it comes to its origin, how it arrived in Cebu, and when it was found again during Legazpi’s arrival. But despite our familiarity with the image and its history, there are other historical questions surrounding it. Even Gaspar de San Agustin questioned if it could have been a remnant of Magellan’s voyage. It is known to have come from the land of Flanders, a territory under Charles I of Spain. It was brought to the Philippines during Magellan’s voyage. On their 7th day in Cebu, when they were about to baptize Juana, they showed her an image of the Our lady, a beautiful image of the infant Jesus, and a cross. After seeing them, she was overwhelmed and then she asked to be baptized and begged them if she could have the wooden Infant Jesus.The following day Magellan approved the giving of the Infant Jesus to the queen and to be put on in place of her idols, as an aide-mémoire of the Son of God. Then it took another forty-four years before the image of the Sto. Niño surfaced after it was found by a lowly soldier in one of the houses of the leaders of the natives. Juan Camus, the soldier, just like Juana in Magellan’s time, was also stunned when he found the image thus screaming in his Vizcayan tongue: “For the body of God, I found the Son of the Holy Mary.”‘They broke open a chest and discovered a beautiful bust of the child Jesus…among numerous cloths and flowers, without being able to inquire from whence the divine image came to the hands of the barbarians, or even reason for the reverence they seemed to have for it.’ Just like Magellan, Miguel Lopez de Legazpi was also a devout captain general, who is the protector of the Confraternity of Jesus. After the Augustinian fathers were informed, ‘the entire army, with fervent tears, they undertook a procession, going to the house, and carried the reward as a gift from God in consolation of their pilgrimage.’ From the same place where it was discovered, an altar, and later a convent and a church were built. The Holy Child, however, devotionally was always referred to the Most Holy Name of Jesus, pointing out directly to his Incarnation. Being born as a human, he was given a holy name which everybody has to knell before, thus Legazpi dedicated his life to make Jesus’ Holy Name known and venerated throughout the archipelago. 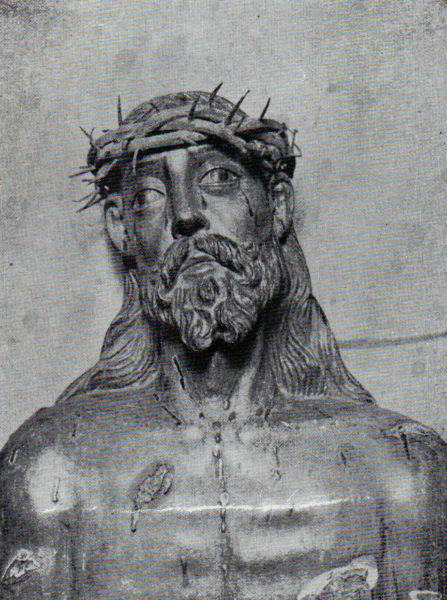 The third religious icon to have been brought by Magellan in Cebu is the Ecce Homo – a sculpted wooden bust of the suffering Christ. The image was a gift of Magellan to Rajah Hamabar or Humabon after his baptism wholater took the name Charles.Its discovery was uniquely narrated by Gaspar de San Agustin in his Conquistas de las Islas Filipinas. 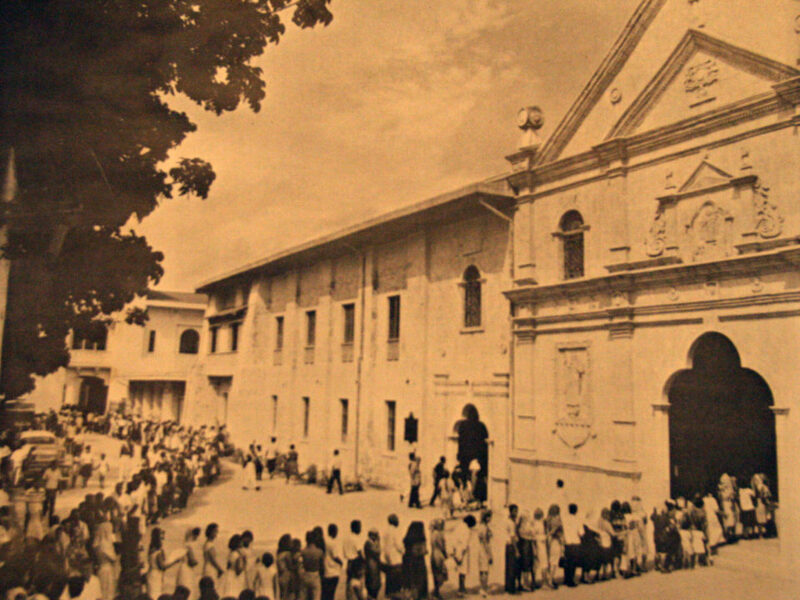 The finding of the Ecce homo in Cebu coincided with the same day Miguel de Legazpi died in Manila on August 20, 1572. It was unearthed in the place where the famous and ancient leader of the island named Rajah Carli (assumed to be Humabon because of its proximity to Carlos) was said to be buried.It was also found by a soldier named Juan de Castilla who wanted to erect his house in that place. While digging, he uncovered a casket with a dried corpse presumed to be a baptized Christian during the time of Magellan because it had a small cross in his hands, while on his chest, they found the Ecce Homo. The image also caused them much admiration. Thus, they carried it with devotion to the church and place it on the tabernacle. Gaspar added that the written testimony of this admirable finding was preserved in the archives of the municipal council and the regiment of the city that has been gifted and privileged so many times by the Lord with similar mysterious discoveries. The only other historical annotation of the image was in Martin de Rada’s writings known as the Memoria, in which when Diego de Herrera was sent back to Spain, Rada asked him to mention to King Philip II about the Sto. Niño and the Ecce Homo which were rediscovered in this country. 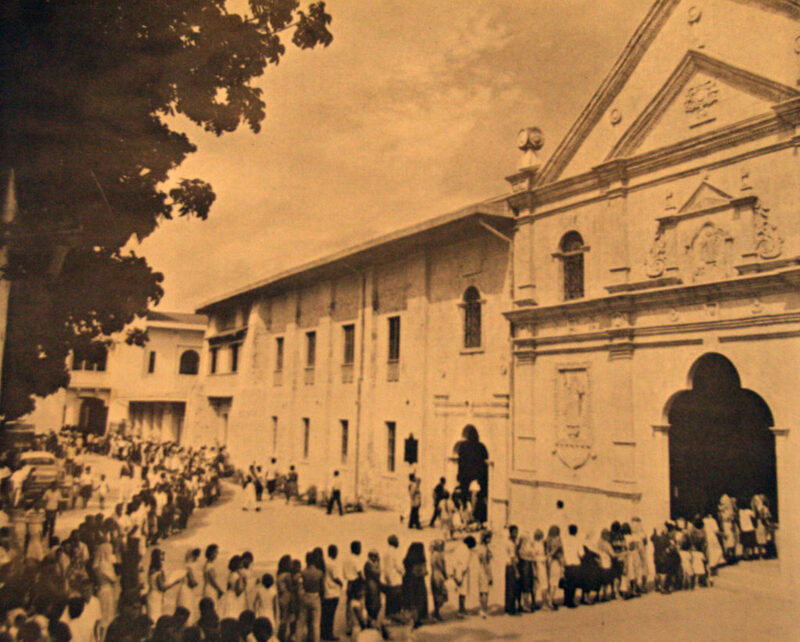 In 1965, the image was brought to San Agustin church in Intramuros, Manila during the celebration of the 4th centenary of the Christianization of the Philippines. Then it stayed there for 46 years. It was only in 2011 that it was returned to the Basilica del Sto. 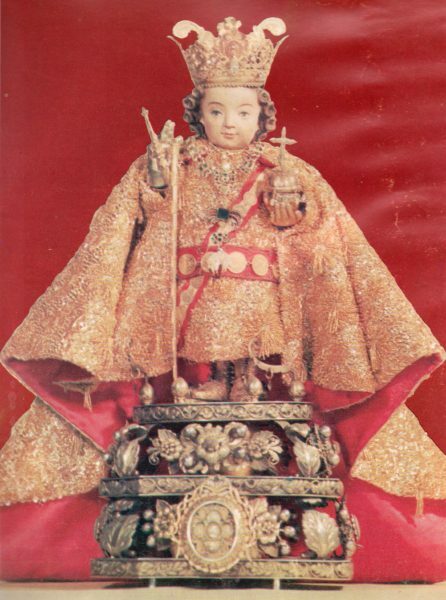 Niño after the request of the late Ricardo Cardinal Vidal, bringing back that important relic in the history of Cebu. Thus, now enshrined at the right wing of the church.Not so famous though compared to the first two relics, the Augustinian friars tried to promote its devotion, but it was always overshadowed by the celebrations of the Sto. Niño even until today. Antonio Pigaffeta. Ilprimo viaggiointorno al mondo. Limena, 2014. Antonio de Herrera. Historia General de los Hechos de los Castellanos en las Islas y Tierra Firme de Mar Oceano. Madrid, 1726. Antonio de Morga. Sucesos de las Islas Filipinas,1910. Francisco Colín, SJ. Labor Evangélica. Tomo I. Barcelona, 1900. Gaspar de San Agustín. Conquistas de las Islas Filipinas. Manila, 1998. Juan de Medina. Historia de los sucesos de la Orden de N. G. P.S Agustín de estas Islas Filipinas. Manila, 1893. Juan de Grijalva. Crónica de la orden de N.P.S. Agustín en las Provincias de las Nueva España. Mexico, 1985.